In co-operation with the Norwegian collector manufacturer Aventa, Fraunhofer ISE has developed a solar collector made of plastic. 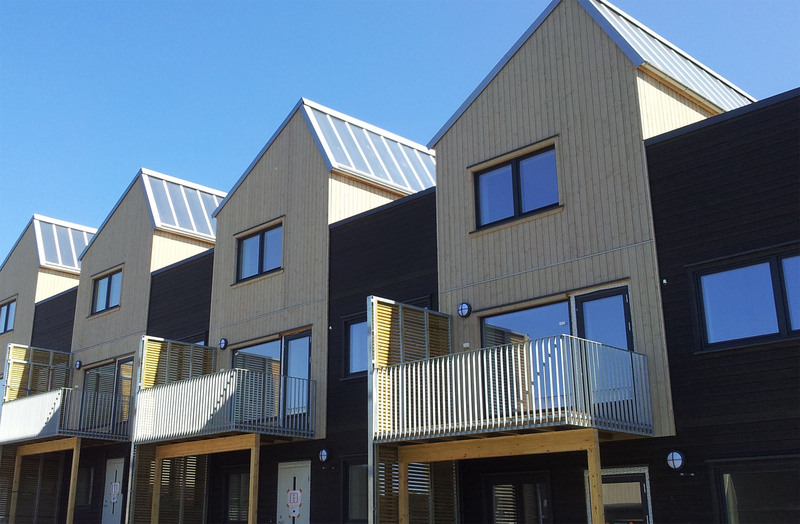 Demonstration systems with this technology have now been put into operation on an estate of terraced houses in Mortensrud in Oslo. The south side of each of the roofs at the Stenbråtlia estate have been equipped with 14 m² of solar collectors, which together with an 800 litre thermal storage tank will cover 62% of the overall hot water and heating requirements of 34 passive terraced houses. Space heating is provided by a water-based floor heating system. The all-plastic collectors, which are made with extruded twin-wall sheets, were developed as part of the joint European project SCOOP (Solar Collectors Made of Polymers). "The solar systems in Stenbråtlia demonstrate that aesthetics and cost efficiency are not mutually exclusive," said Michael Koehl, project manager for Fraunhofer ISE's EU project SCOOP. "On the contrary, the results of studies conducted during recent years have shown that plastic materials are very suitable for the construction of advanced solar collectors. We can now prove this with a practical application."